Shires Vets are proud to offer our extensive pet health care services with a team of experienced veterinary surgeons and nursing staff based at four main practices at Stone, Stafford, Eaton Park, Hanley and Eccleshall with branches at Gnosall and Loggerheads. From routine health examinations to detailed surgical procedures, utilising and employing the latest research and developments, our team are experienced in handling a large array of pets from dogs, cats and rabbits to chickens, goats and bearded dragons. We are open for urgent cases at our Stone surgery up until 10pm Monday to Friday and 8am-4pm Saturday and Sunday, ensuring we can provide you and your pet with the care you need, when you need it. 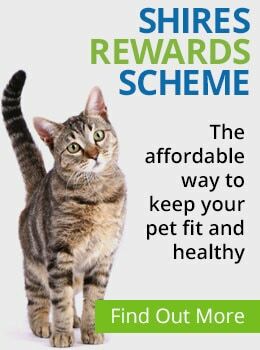 By working together the Shires Rewards Scheme enables our clients to spread the cost of veterinary care and save money whilst helping to ensure your pet receives the best care available. Please contact us today to make an appointment or speak to a member of our team. "I've would never go anywhere else as the team at Shires are fantastic and so caring." "Excellent care and treatment of both pets and their owners . I recommend them to everyone I meet." "Thank you so much for the care of our St. Bernard - marley. Especially Ted who we can't thank enough." "Our brave cat was operated on today. He had a huge stone in his (particularly small) bladder and was given an operation appointment immediately. We had a phone call during the op and another afterwards and were assured that his usual vet had also been in touch. They will see him on Saturday, just to make sure he's ok. What wonderful treatment! (And he's been like a new cat since he got home!)" "Just to say a HUGE thank you to you all for looking after Stella for me! She's had steamed cod loin and boiled rice for her tea and is currently snuggled up on the settee! It's fantastic to have her home again! xxxx"
"Best Vets ever my German Shepherd wouldn't be here today if it wasn't for Will, he did ligament ruptures on both of his back knees, he bounces round like Bambi again now. Couldn't live without my dog!. Worth every star, also how many Vets would take in little rescues like that puppy without wanting to know who's paying. Five stars is not enough!" "Today the difficult decision was made to put our loved horse Bella to sleep. Cathy, I can't thank you enough. You were so kind, loving, compassionate, caring and treated Bella with such dignity. Your care towards our other pony that was clearly distressed was amazing too! Thank you for everything. I am eternally grateful." "Just switched to Shires, definitely not a decision I regret! My pony Timmy has just been diagnosed with laminitis, a very difficult time for us. Frankie came out to us on Monday, he was very VERY patient with both myself and Timmy, the reception staff are also very friendly and happy to help." "Been my 'horse vet' for over 22 years. Great medical and people skills." "I have used this vets for 13 years and they are fantastic, can't fault them." "Brilliant. Great service, very friendly and understanding, put at your ease." "Absolutely fantastic service. Can't fault them at all."